This week's "Employee of the Month" is Barbara. She came to work at Gallery Graphics back in late 1999 & just never left. 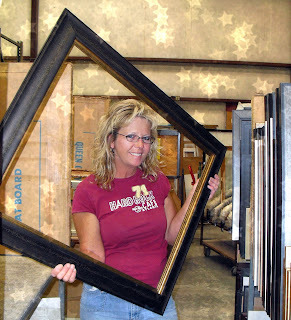 She is the overseer of the wacky framing bunch & the guys in the "Saw Shop"(which you will meet 1 by 1). Barbara enjoys getting right in the trenches with her team to bust out 100s of frames a day. Quality is something she prides herself on & there is never a time she doesn't want to hear about how to improve it. Per Barbara ~ I would like to say that MY CREW is great - The teamwork is E-X-C-E-L-L-E-N-T!! It makes the day more enjoyable. Reasons for working here? 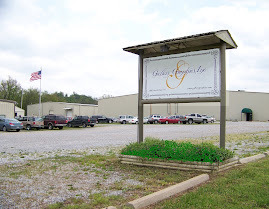 Loves the location, snuggled into the Ozarks and great hours, what's not to love!! Barbara's Favorites: How Bout a Kiss by Robert Dawson 3352-6000 & Cowboy Puppy by Robert Dawson 3352-4741 (I see a theme here). Her wonderful daughter Ashley will be graduating from OSU in the Spring of 2011 & then it will be "Easy Living" for Barbara... Yeah right Barb!! Have a SAFE & happy Fourth of July! !